Mining is a well run industry with a lot of emphasis put on safety. 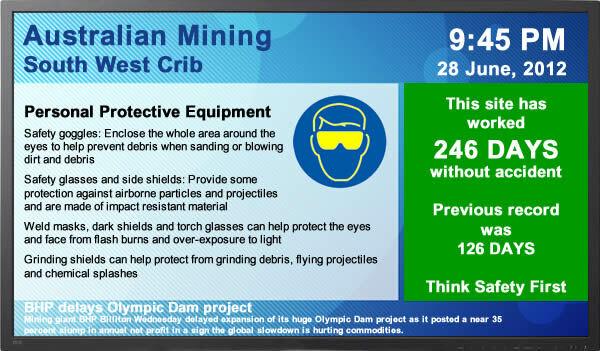 Digital Signage and Internal Communication assists in the dissemination of information to all staff at the mine site. Command digital signage solutions can be installed inside and outdoors in locations such as Administration areas, Meeting Rooms, General Access Areas, Training Rooms, Security, Crib and Camp areas. Digital Signage is the ideal platform for internal communications, OH&S Training, Security Messaging, Production Messaging, Alert Messages and General Information. The continuous eye-catching movement helps in reaffirming company policies and safety messages.